This beautiful home is the only one of its kind in the area. Situated on one of the highest peaks in Manuel Antonio, Casa Bella Vista enjoys stunning views of the world-famous Manuel Antonio National Park and bay. Upon entering the home, the soaring ceilings and sweeping staircase create a feeling of lightness and air, and the custom stone waterfall adds the soothing sounds of the rainforest to the atmosphere. Every room in the house is designed to take advantage of the spectacular views. Casa Bella Vista has recently been redecorated and the result is amazing. It is a warm, luxurious space, full of surprising details and tropical twists. Care has been taken with each room to ensure maximum comfort, including comfy reading chairs and comfortable patio furniture on each balcony. The spacious master-suite has a king size bed, private balcony, walk-in closet, TV and en-suite with ocean view Jacuzzi tub. 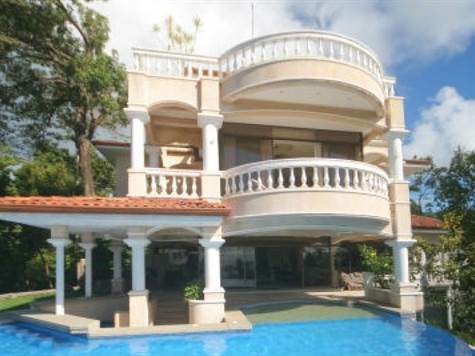 Each of the other 3 bedrooms is spacious and has private balconies with ocean view. 2 of these bedrooms are equipped with queen beds and 1 with two doubles. All bedrooms have central air conditioning and private bath. The large, custom fit kitchen, with stainless steel appliances, is perfect for the guest who loves to cook, or to enjoy the services of a private chef. The sunken living room and dining area open up onto the infinity pool and terrace. The pool has been specially designed to help you beat the heat, with a covered, shallow beach area, perfect for reclining and relaxing. Enjoy sunset cocktails at the swim-up bar! Entertain at the fourth floor bar leading onto a large lookout terrace, that makes you feel as though you are floating on air. Ceiling fans throughout and ocean breezes cool the home. An unbeateable location and estate home.